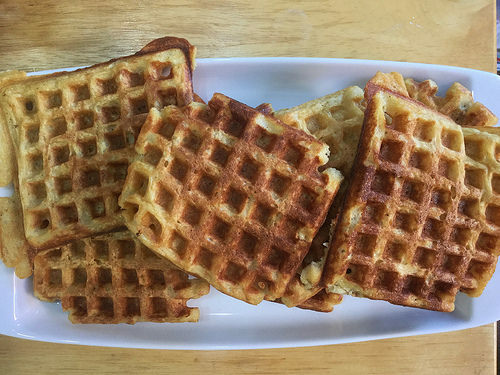 For a basic recipe, this isn't a standard waffle. But it's my standard waffle, the recipe I make when I make waffles. These guys start with all-purpose flour, but get an assist from cornmeal, which adds extra flavor, color, and a mildly rustic texture. And this recipe isn't a quick batter: these waffles get their loft—not to mention even more flavor—from active dry yeast. They're still dead simple to throw together, thanks to the fact that the yeast batter sits overnight to develop. Which also means you're measuring your flour out the night before instead of first thing in the morning, which I consider a bonus, too. Finally, there's the faintest hint of warmth from the addition of ancho liqueur, and it's matched by an equal amount of orange liqueur. The effect is seriously subtle (you might never have noticed it if you didn't know it was in there). All of these tweaks are gentle—the cornmeal, the yeast, and the liqueur. 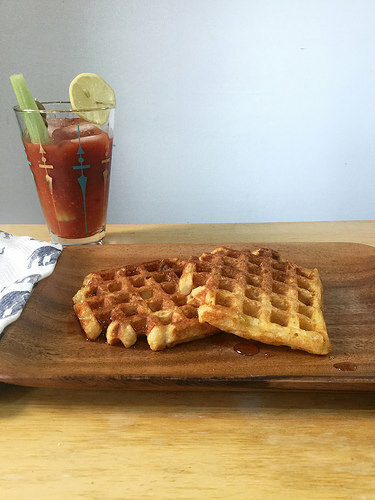 So when you get ready to drizzle on the maple syrup and tuck into these waffles, you still feel like you're sitting down to a pretty classic breakfast dish. Just with more notes than toasted wheat and syrup. If you have a mild sweet tooth, especially when it comes to breakfast, then you may make this your go-to waffle, too. If not, give it a shot when you find yourself in need of a twist. In a mixing bowl, whisk together flour, cornmeal, sugar, yeast, and salt. Whisk in milk. Cover with plastic wrap and transfer to refrigerator. Let sit overnight.